Can yoga truly be for everyone, regardless of their age? Well, just like how one is never too old to take up the exercise, one is never too young either. In Megan De Kok’s baby yoga class, some babies have already been participating in her class when they were only a few weeks old. As a parent herself, Megan brought her own daughter to be part of the class when she was merely three weeks old. Megan mentioned that one of the key benefits of baby yoga is that it enables a bonding experience between the parent and child. Previously, she used to work with school-age pregnant girls. She would assist them by teaching them parenting skills. It was only through this that she realised just how essential it was to focus on both parent-child bonding as well as relaxation. This eventually led her to learn more about baby massage and baby yoga after she had her first daughter three-and-a-half-years ago. “It’s very bonding for the parent and child because they’re doing everything together,” she stated. The best part of it all is that each session allows both the parent and the child an opportunity to exercise as well as relax. “It’s really important to teach babies and children relaxation. In today’s society children become over-stimulated. Relaxation is a learnt skill. If you teach it to children when they’re small, it sets them up for life,” she explained. Although each session is filled with pretty young babies, the parents still felt it was relaxing when they get the chance to enjoy the special time with their children. For quite a number of parents, they even practice when they are at home. According to one parent, the sessions were able to improve her daughter’s motor-skills and flexibility as well as boost her confidence. Megan added that songs are utilised to aid the babies in learning the movements. There are times when the babies are involved in the movement, usually being swung around by their parents. At other times, they are encouraged to mimic the actions of their parents. “When the children are a bit older they can do things like the downward dog position themselves. Bonding and relaxation are just so important. Focusing on your breathing can really help you to relax, and it can help your baby to relax too,” said Megan. To read more on the story, you can do so here. 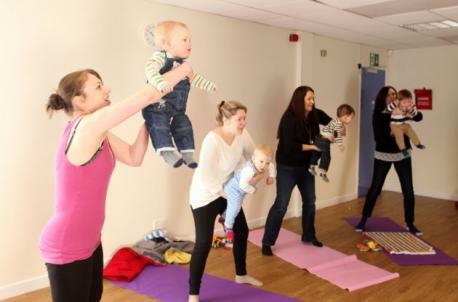 At OMG Yoga Singapore, we do offer baby yoga classes. However, only private sessions are available for it. Although our website doesn’t have the details on it, you can always drop us an email to learn more.